As a longtime local of Colorado Springs, Wade Petersilie was first introduced to the art scene at Coronado High School and continued his interest through college studying both industrial arts and jewelry design. With over 34 years of experience, Wade creates pieces that range from stunning Contemporary Southwest to sleek Traditional, sometimes throwing in a bit of European influence as well. He is a master of design and a true original in today’s world. Wade is a craftsman whose priority is beauty, and his insight and passion for his work are the driving forces in his life; “I prefer the sculptural pieces that are interesting or surprising, that catch the light differently from various angles and are pleasing from all sides. It serves its purpose if it revokes a response.” He draws inspiration from his surroundings: art, nature, architecture, and the personalities of those for whom he designs custom pieces. For Wade, his art is not just a profession, but a lifelong passion that shows in his workshop; tools of the trade that have been lovingly used with pride for decades. Being in control of every step of the process is what makes a piece of jewelry truly custom. 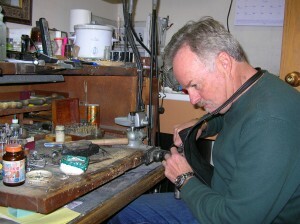 Wade guides his clients through each step seamlessly as their pieces are created. His heartfelt desire is to share with his clients the beauty and wonder of natural stones and precious metals. Whether diamond, opal or turquoise, precious or semi precious, there are limitless possibilities. Once the stones and metals are selected, Wade’s craft in the workshop can truly begin. What is it that you desire? You are only limited by the imagination, as almost anything can come to fruition by this master jeweler. Wade is a Graduate Gemologist certified through the Gemological Institute of America and a member of the Accredited Gemological Association. Exclusive galleries and fine jewelry stores throughout the United States have displayed Wade’s work. Aspen, Vail, Carmel, Jackson Hole, Nashville, Houston and Nieman Marcus are just a few of the locations which have created a following for this Nationally renowned artist. His work has also been featured in Jeweler’s Circular Keystone International magazine and exhibited at the JCK International Jewelry Show in Las Vegas. Creating fine jewelry since 1979, my designs feature structural shapes, bold lines, and unique stones settings that let the mind experience shape and style beyond the traditional boundaries. Custom designs are influenced by the polish and texture of the settings as well as the gemstones themselves. I take great pride in building pieces that offer a functionality and uniqueness that capture the aesthetics that matter most to you.